Tourist Oriented Directional (TOD) Commercial Sign Rates: If you are a “for-profit” business download the fee schedule PDF. Non-Profit Tourist Oriented Directional Sign Rates: If you run a non-profit business, download the fee schedule PDF. Advance Sign: The first or primary sign a business has in any given direction of travel is known as the Advance sign. 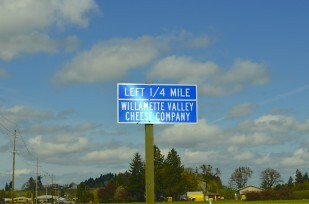 This blue sign is usually ¼ mile from the intersection. It has a directional designation, (e.g. Next Left), and all or part of the registered business name. On the billing invoice, these signs are referred to as “ADV”. Intersection Sign: The secondary sign a business may have in any given direction of travel is known as the Intersection sign. If a business is not visible from the intersection where the motorist turns off of the highway, they may require an Intersection sign. This blue sign typically includes a directional arrow, and all or part of the registered business name. When necessary, mileage is also indicated below the arrow. On the billing invoice, these signs are referred to as “INT”. The placement of Advance and Intersection signs is determined by an engineering study of the highway. If more than one TOD business requests a sign at the same intersection, four boards may be installed on the same Advance or Intersection posts. TOD signs consist of a blue sign panel stating in white the name of a qualified attraction that provides the general public with agricultural, cultural, historical or recreational activities. There are two types of TOD signs: Advance and Intersection. The Advance signs are located about ¼ to ½ mile from the intersection or driveway where the motorist turns off the highway. The Intersection signs are located at the intersection or driveway and have arrows pointing toward the business and mileage indicators to the business. TOD signs are seen as alternatives to billboard advertising by many businesses, but in fact they are classified as traffic control devices and must meet all regulations set by the Federal Highway Administration and Oregon State sign standards. If the Travel Information Council (TIC) doesn’t follow the Federal and State sign regulations, the Oregon Department of Transportation (ODOT) could lose a percentage of its Federal funding. How long does it take to get TOD signs? It all depends on the variables involved. In addition to our criteria and roadway review process, new sign installations require an ODOT engineering review. Our goal is to turnaround sign applications within 5 days. ODOT is allowed another 40 days on reviews which are forwarded to them. Once approved, the timetable adjusts based on the time required to fabricate the signs and have them installed by a specified sign crew. The total estimated time for the entire process is 60-90 days. What does it cost to have TOD signs? Annual permit fees are based on the average daily traffic count at the location of each Advance sign. See the For-Profit TOD sign rates page for more information. Non-Profit and Governmental Entities are assessed annual permit fees at a reduced percentage of the For-Profit rate. See the Non-Profit TOD rates page for more information. How does a facility qualify for TOD Signs? Agricultural means an activity or business illustrating local and/or Oregon specialized livestock or agricultural products and processes, production and sale of freshly harvested produce, or cultivation and sale of seasonal agricultural products. Types of Agriculture that will require additional proof of license, acreage, map or brochure: Brewery, Brewery District, Coffee Roasting/Tasting, Distillery, Tasting Room, Tour/Trail, Vineyard, Winery, Winery District. Brewery/Cultural/Historic/Winery District means a cluster of like breweries, antique stores, museums, vineyards, wineries or tasting rooms in a concentrated area of no less than six city blocks in size and with no less than four Businesses. Cultural means an activity or business relating to local and/or Oregon artistic pursuits, events, handicrafts, artisan demonstrations, or local gift/souvenir shops. Historical means a business or activity based on history reflecting the past events of the area where the business or activity is signed. Recreational means any business or activity that people engage in during their free time as by means of agreeable exercise offering a form of leisure, amusement or relaxation. Businesses offering Gas, Food, Lodging and Camping services must apply for Off Interstate Logo signs – not TOD signs. What is the minimum level of services required for TOD signs? If my business is seasonal and only open part of the year, can it still qualify for TOD signs? Yes! If your business is closed for 30 or more days consecutively you may qualify for seasonal riders stating your open hours, days or season or your signs can be covered with blank panels during the closure. Please indicate on the application your open hours, days or season. What areas or locations are considered eligible for TOD signs? TOD signs may be installed along any highway as long as it meets sign spacing requirements. Some cities have been determined as too congested for additional signing due to the existing on-premise and highway signs already installed. Cities with “no TOD zone” areas include: Bandon, Coos Bay, Florence, Newport, Lincoln City, Seaside, Astoria, McMinnville, Dundee, Newberg and Sherwood. Are TOD signs allowed on interstate highways or expressways? No. TOD signs are restricted to conventional or secondary highways that are not classified as interstate highways or expressways. What if the information on my TOD sign needs to be changed? If a replacement is requested by the customer due to a name change, a fee will be charged per sign to cover the costs to manufacture and install the new TOD signs. To qualify for TOD signs, a facility must not be visible or recognizable to the motorist within 300 feet of the approaching intersection or access to the facility. If there are road conditions (brush, trees, etc) that hinder the visibility within that 300 foot area, the business may qualify for signs. How much advertising can be put on a TOD sign? None. Only the facility’s Registered Business Name or a portion of that name is allowed by Federal standards. What if the business name changes? If a replacement is requested by the customer due to a name change, a fee of $255 per Advance sign and $195 per Intersection sign is charged to cover the costs to manufacture and install the new TOD signs. Can private clubs have TOD signs? The following application and cover letter (explaining the TOD category) are available for you to download on your computer. To read PDF files, you will need the free Adobe Acrobat Reader. This is free downloadable software on the Adobe solutions website and will help you to print out your application and fill in by hand. Unless you have Adobe Pro (a paid software component) you will not be able to fill in the above permit applications on your computer. The files have not been formatted to allow for this. If you would prefer documents in Word, which may be filled out on your computer, please use this link. Please contact our office if you experience any difficulties printing your brochure and we will mail you one. OTIC Cover Letter for TOD sign: Read the letter explaining the TOD in PDF format. Tourist Oriented Directional Application (TOD): Download a PDF copy of the popular TOD sign.